Lucas using PK Fire in Ultimate. PK Fire (ＰＫファイヤー, PK Fire) (called PSI Fire in the English version of EarthBound) is the side special move of both Ness (neutral special move in Super Smash Bros.) and Lucas. When performed, the character fires a yellow, lightning-bolt shaped projectile, that travels in a straight line until it hits an enemy or destructible portion of a stage, at which point it explodes into flames. If it does not hit either of the aforementioned objects within a few feet or hits a wall, then it dissipates. The way the PK Fire moves and explodes differs between the two EarthBound representatives. Ness' PK Fire has been the same through the entire Smash Bros. series. Ness's PK Fire travels forward at an angle on the ground, while travelling diagonally downwards if used in mid-air. If Ness' PK Fire hits, it explodes into a stationary pillar of fire that hits his enemies several times. In mid-air, however, it falls down slowly until it hits the ground or dissipates. DI is not very effective against it, allowing Ness to combo his opponent or use one of his finishers while the enemy is stunned. Ness can use this move in conjunction with his second jump to perform the PK Jump, which slightly boosts the air speed of his second jump at the expense of height, giving him a slightly better approach. The main difference is the damage within the games and the lag/speed of the move. It does overall the most damage in Super Smash Bros. Brawl, followed by Super Smash Bros., and then followed by Super Smash Bros. Melee. This is a simple combo often used for gimping. This is best done near a ledge. First the player must use Ness' PK Fire on an opponent. Then they must follow up with a forward throw, which will knock them off the edge. From here, they can use Ness' down aerial meteor smash, which will usually KO the opponent. Alternatively, the player may use d-throw after PK Fire, and if near the edge, finish with a down aerial. However, the opponent can easily DI the forward throw and avoid the down aerial. Still, when used in surprise, it can be an effective combo. Ness's down throw in Brawl. Ness's down throw in Melee, Brawl, Smash 4, and Ultimate also involves PK Fire. Ness will throw his opponent to the ground, and then burn them with a scaled down PK Fire. In Melee, this will deal 8% damage overall, while in Brawl and Smash 4, this will hit with 5 blasts of Flame, dealing 1% damage each, and then the opponent will take one final blast, dealing 4% damage, making a total of 9% damage overall. Lucas's PK Fire hitting Sonic in midair in Brawl. In all of Lucas's Smash Bros. appearances since Brawl, his PK Fire always travels horizontally, regardless of whether or not he is in the air. When the bolt hits an opponent, it explodes into a horizontal burst, hitting once, and dealing fair knockback to the enemy. The horizontal burst has good range, and can damage others in the way of the burst, although it deals very little knockback. 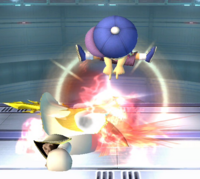 Lucas' PK Fire has many interesting properties, such as pushing him back with a set force after shooting the bolt. Because of these, Lucas can use his PK Fire in Brawl to perform the Zapjump, the Wavebounce, or, an extension of the Wavebounce, the Magnet Pull, making this one of Lucas' most varied moves. "A lightning bolt that erupts into a flame pillar when it hits an opponent." "The lightning bolt doesn't travel as far, but the flame pillars stick around longer." "The lightning bolt releases a single flame when it hits. Knocks opponents farther." PK Bonfire: The bolt doesn't travel as far, but the flame pillar sticks around longer. PK Fire Burst: Essentially Lucas's variant of PK Fire. The bolt explodes in a single hit, and knocks opponents farther with higher knockback. It will always travel horizontally, even when used in the air. "This ball of light explodes when it hits, erupting into a column of flame that launches enemies." Like the other DLC characters, Lucas lacks custom move variations. Kumatora using PK Fire β in Mother 3. PK Fire (localized as PSI Fire in EarthBound) first appeared in Mother and has appeared in later Mother games since. In all three of the Mother games, the move involved using the character's psychic power to send fire at the enemy. However, in the Mother series, neither Ness nor Lucas learn the move; instead it is learned by one of their friends and party members, Paula in EarthBound and Kumatora in Mother 3. In the description for the move in EarthBound, it states that fire bursts from the player's fingertips onto a row of enemies. When Ness and Lucas perform this attack, fire comes from their fingertips, which is how the move is described in EarthBound. Ness' PK Fire animation is similar to Master Green from Kirby's Dreamland 2, and the Z Spark it produces is the same as the one used in the game. Ness using PK Fire in SSB. Ness using PK Fire in Melee. PK Fire in Super Smash Bros. for Nintendo 3DS. 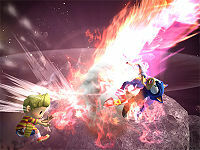 Ness connecting with PK Fire in Super Smash Bros. for Wii U.
Ness and Lucas using PK Fire in Super Smash Bros. for Wii U.
Ness using PK Fire as shown by a Skill Preview in Ultimate. Lucas using PK Fire as shown by a Skill Preview in Ultimate. This page was last edited on March 22, 2019, at 11:20.